The modern era of Doctor Who has seen many specials that aren’t part of the regular season or series of episodes, but are just as entertaining. Many of them cover important developments about the Doctor, notably his regenerations. Often, these specials air during Christmas or in between long stretches of seasons. Some of the specials aren’t even aired on TV but are found online as mini webisodes and reveal many interesting aspects of the Doctor. These are the best specials to date. 10. “Voyage Of The Damned” The Tenth Doctor (David Tennant) finds himself in an imperiled space-going luxury liner named after the Titanic. Can the Doctor and assorted crewmembers and passengers keep the ship from suffering the same fate as its namesake? Well, he isn’t called the Doctor for nothing! 9. “The Snowmen” The Eleventh Doctor (Matt Smith) mourning the loss of his Companions lives in self-exile in Victorian London. While he is drawn to an eerie mystery involving sentient snowmen, he encounters a perplexing woman, future Companion Clara Oswald (Jenna Coleman), who he keeps running into during his time travels. Coleman shined in her introduction as the spunky Clara. 8. “The End Of Time, Parts One and Two” David Tennant’s swan song as the Doctor was probably a bit overblown and too long. Still, it was memorable for returning the Doctor’s nemesis, the Master (John Simm), who was a pawn in a plot to reignite the Time War. 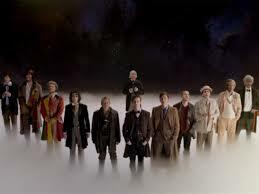 While the Doctor’s demise dragged on, it was nice seeing him bid subtle farewells to his Companions throughout time. 7. “The Waters Of Mars” One thing Doctor Who excels at is putting out genuinely creepy tales. This one, which won the Hugo award, isn’t an exception as the Tenth Doctor aids the first human colonists on Mars infected with an intelligent virus. 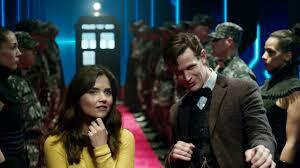 What was more unsettling was the tragic result of the Doctor trying to change history. 6. 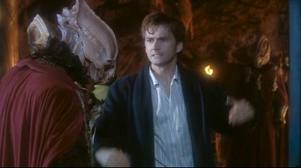 “The Christmas Invasion” In his first full outing as the Doctor, David Tennant grabbed the role and ran with it. As he and his Companion Rose Tyler (Billie Piper) struggles to deal with his regeneration, the world comes under an alien invasion on Christmas. While the Doctor is busy getting used to his new body, Rose and her associates must deal with the alien threat on their own. 5. Various Webisodes. These minutes-long stories were often some of the best Doctor Who stories. Whether it was about Paul McGann returning as the Eighth Doctor (“The Night Of The Doctor”) or the Tenth Doctor meeting the Fifth Doctor (Peter Davison) in a weird time quirk (“Time Crash”) or Rose’s confused and frightened reaction to the Doctor’s regeneration (“Doctor Who: Children In Need”) these nuggets added to the rich lore of Doctor Who. 4. “The Next Doctor” Before his iconic role as the sadistic Governor in The Walking Dead David Morrissey excelled in this special as an alleged future Doctor incarnation. 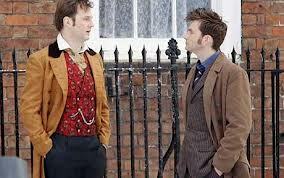 The Tenth Doctor meets him in London in the 1850s and the two team up to stop a Cybermen plot. Morrissey’s exuberant performance as the amnesiac Doctor a.k.a. Jackson Lake left many fans wishing he would be cast as a Doctor sometime in the future. He captured the essence of being a Doctor and his character’s tragic back story was unforgettable. 3. “The Time Of The Doctor” In the most recent special, Matt Smith’s gave a truly heartfelt performance as the Doctor for the last time. The story about the Doctor sacrificing his natural lifespan to stay on a planet and defend a town called Christmas was a bit rushed and should’ve been longer, but the finale just tugs at the heartstrings. 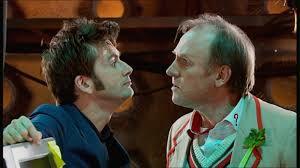 Unlike Tennant’s Doctor, this version faces his impending natural death and regeneration with maturity and wisdom. He reminds us that change is part of life and that it’s good as long as you remember your past. A Doctor’s farewell couldn’t be more poignant. 2. 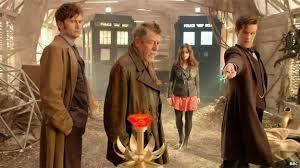 “A Christmas Carol” The best Doctor Who special about Christmas is this adaptation of A Christmas Carol. To save his Companions’ live, the Doctor must change the cruel and bitter ways of a Scrooge-like figure (Michael Gambon). The Doctor makes brilliant use of time travel to subtly reform the lost soul throughout his life in this loving tribute to Dickens’ classic. Actually, the story enhanced the classic with a tragic love story that is uplifting at the same time. The special also featured some of the most out-of-the-world imagery, specifically that of a flying great white shark (!) that is eventually used to pull a carriage through snowy skies. 1. “The Day Of The Doctor” This is the all-time best special and not just because it celebrated the 50th anniversary of Doctor Who. It had an epic story as the two Doctors (Tennant and Smith) that won over legions of fans in modern times united to solve a mystery regarding the ominous Time War. Many puzzles were solved as we learned about that war and the mysterious War Doctor (John Hurt), who was just outstanding. What’s more, there were many nods and references to the show’s long and rich history that culminated in the Eleventh (or rather the Thirteenth) Doctor meeting the Curator (Tom Baker, the Fourth and most revered Classic Doctor). For the most part, the special delivered for this special occasion and set a very high standard for such events.